Άρθρα για τις φθορές και την συντήρηση του βιβλιακού και αρχειακού υλικού. 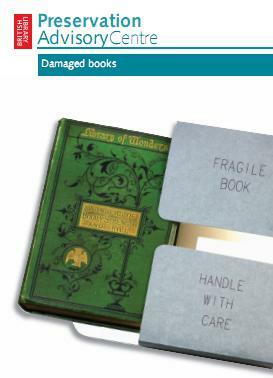 Caroline Bendix, «Damaged books», Preservation guidance booklets, The British Library, February 2010. Carmen Crespo and Vicente Viñas, «The Preservation and restoration of paper records and books: a RAMP study with guidelines», General Information Programme and UNISIST, Unesco, Paris, 1985. Catherine H. Stephens, Timothy Barrett, Paul M. Whitmore, Jennifer A. Wade, Joy Mazurek, and Michael Schilling, «Composition and condition of naturally aged papers», Journal of the American Institute for Conservation 47, 2008, 201-215. Artemis BonaDea, «Conservation Book Repair: A training manual» , Alaska State Library, Alaska Department of Education, 1995. Cathleen A. Baker, Sodium Carboxymethylcellulose (SCMC) Re-evaluated for Paper, Book, Papyrus, and Parchment Conservation, 2010 and Leyla Lau-Lamb, A New Material for the Conservation of Papyrus, 2010. Margit J. Smith, «The Medieval Girdle Book and Advanced Paper Conservation Workshops», Amigos Fellowship Final ReportDecember,University of San Diego, 2004. Daria Kordowska, «Conservation work on three Coptic manuscripts from Seike ABD El-Gurna», Egypt, 2006. Edward P. Adcock, «IFLA Principles for the care and handling of library material», International Preservation Issues, Number One, International Federation of Library Associations and Institutions Core Programme on Preservation and Conservation and Council on Library and Information Resources. Jyotshna Sahoo, «Preservation of library material: some preventive measures», Assistant LibrarianState MuseumBhubaneswar, OHRJ, Vol. XLVII, No. 1. Oya Y. Rieger, «Preservation in the Ageof Large-Scale Digitization A White Paper», Council on Library and Information ResourcesWashington, D.C., 2008. Ronald Becker, Ronald Jantz, Brian Hancock, Harriette Hemmasi,Vincent Pelote, Kristen St. John, Robert Sewell, Chair, Jane Sloan, Farideh Tehrani,»Reinvestment in knowledge: preservation of library materials in the rutgers university libraries», Rutgers University libraries, 2001.